The Long Road to China: Another "Candy Expert"
On Sunday afternoon, my Mom took Nick, Sarah, and my two nephews to the movies and out for dinner. We felt Reagan was still a little too young to make it through an entire movie, so she stayed home with us while the other kids went. The house was especially quiet with two of the three kids gone. Pat and I got to enjoy a little private time with Reagan which doesn't happen too often. We had a great afternoon with her and she was in such a good mood. It was as if she knew she had us all to herself and was digging every minute of it! Her 2nd Birthday was the day before Thanksgiving and with all the craziness of the holiday, I never had the time to get her "2 Year Old" photos done. So I stole about 20 minutes of our afternoon to get some special photos of my baby girl! Remember last year, when I did the cake smash photos? Well this year was a lot less messy, but still SUPER CUTE!! These two photos are my favorites of the day and just make me smile from ear to ear! Her expressions and the way she is sitting make her look like a such a big girl. She is getting tall, her face is changing a little too, and her hair is getting SO LONG. I cannot get over how "mature" Reagan is starting to look. As you can see, our resident "Candy Expert" is not happy when her candy is taken away! While we are truly enjoying everything about "Two", we are finding out that it comes with a little attitude!!! 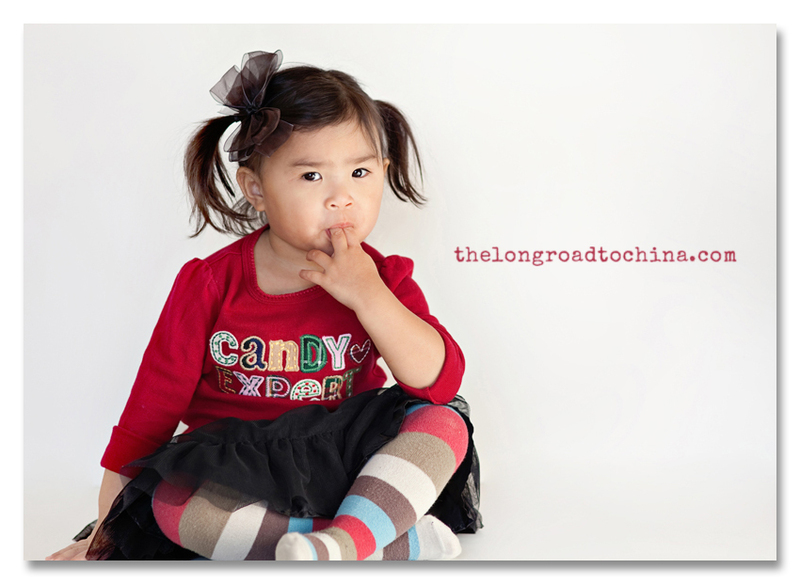 Love the candy expert shots.....she is getting to big..omg love her attitude! Have a wonderful day! She is beyond precious! Maybe some candy canes in her future? LOL, these are SO precious! I love how she's grabbing her little toe in the first one. And she is growing too quickly, tell her to quit that!! Yeah....but 2 was never cuter. Love these pictures Lisa. What a doll - edible. Hope you're week has started great. Fab news that you're not on court duty during this period. Such a cute shirt on BOTH girls! She is more than adorable if that's possible!! Love all her expressions. She definitely looks 2 now, time needs to slow down I think. Hope your week is going well, Lisa. Thank you for sharing, I love your "eye" for cute pictures! Reagan looks deliciously cute!!! She is growing so much!!! I clicked back on the "last year" photos and was just amazed at how much she has changed. I mean really...could that baby girl get any more adorable!!!! Absolutely darling! 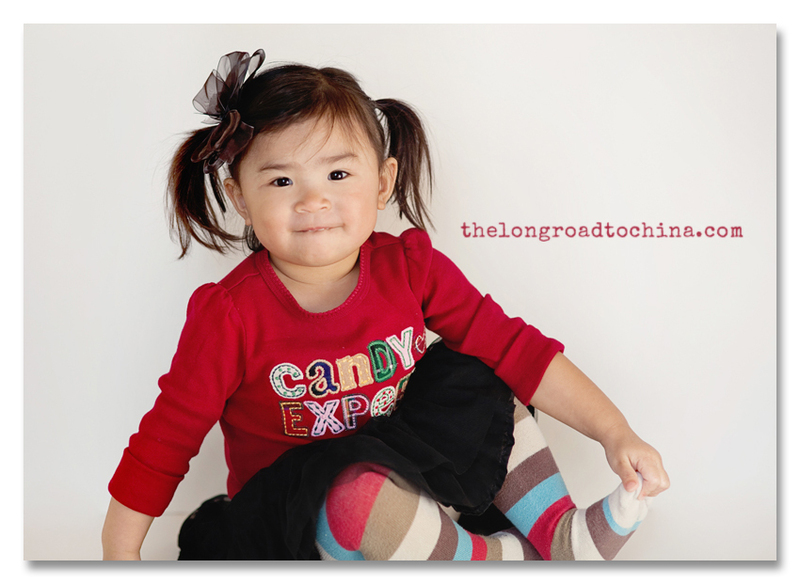 Reagan could not be any cuter and great pics Lisa. She's growing up so quickly! How is it that once our sweet girls hit 2 that babyhood leaves so quickly and toddlers/preschoolers are ever present? 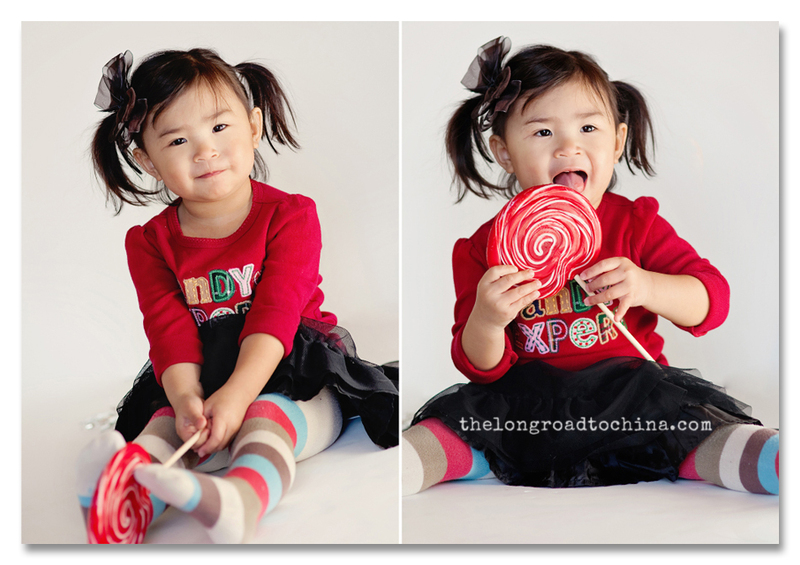 Sweet pics of both the girls in their 'Candy Expert' shirt! Oh my God, I LOVE that last one, with the filthy look! Lisa, you have so much fun ahead in the next few years! Attitude here we come! She's adorable. I can see a toddler peeking through that baby face! Cute with and attitude! What a nice combination (I know all about it, we have a similar girl in our house here...) - I agree with Marla: tell her to slow down growing up! LOVE these, Lisa! Another fabulous photo shoot...you really inspire me to strive to take better photos. And your subjects are simply adorable! Love how much Reagan loves her two little fingers! Oh my word! These pictures are soooo adorable! I completely agree -- Reagan is starting to look sooo grown up! Don't blink! Oh, my word, two is sooo cute on that baby girl. She really is growing but I love that she's still partial to those two sweet little fingers. precious!!!! Especially love that last one--looks like an ad for a magazine! OMGOSH!!!! LOVE her!! I wish she and Emme could be pals! I think they would get along infamously!! They could hide things all over our houses together!!! Oh my goodness...she is such a cutie pie!!!!! HOW CUTE Lisa! I can't believe how long her hair is getting- looks fab in those pigtails.